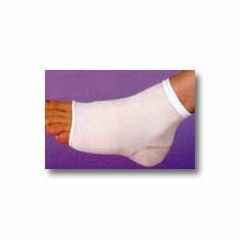 Thero-GelTM Heel/Elbow Protective Sleeve.Cotton and nylon sleeve is lined with Thero-GelTM to soften, moisturize and rejuvenate dry, chafed, cracked heels and elbows. Use to prevent ulcerations and bed sores or to continue promotion of healing process after ulcerations have been closed. Protective sleeve cushions the heel or elbow, reducing shock, vibration and friction. Wear while sleeping or sitting. can be used with softening creams and moisturizers. Hand wash. Circumference measurement applies to top and bottom. Latex free.